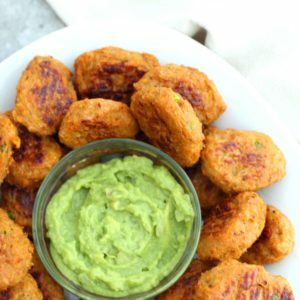 These Whole30 chicken nuggets are super tasty, absolutely filling, and incredibly easy to make. This chicken nugget recipe only has a few ingredients and that’s just the way that I like it – SIMPLE. You’ll still get that crunch that you are used to, but without all the fuss. Don’t worry! 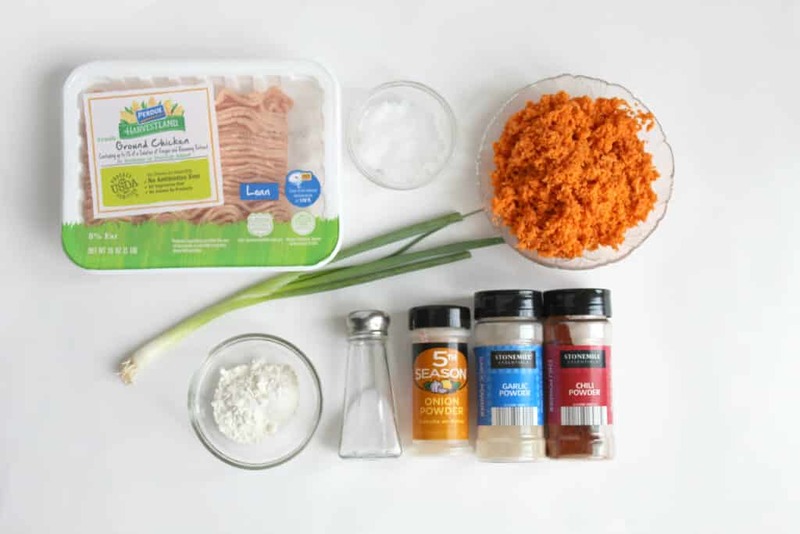 This meal will make everyone in your family happy – kids and adults alike. Paleo friendly chicken nuggets are on the menu tonight. So, let’s get started. 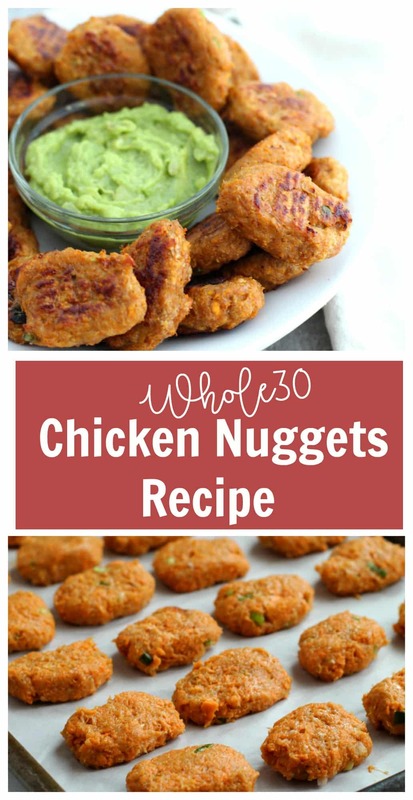 There are a few different ways you can serve these Whole30 chicken nuggets. Traditionally, people usually serve them with ketchup or mustard. But tonight… why not try guacamole!? Oh so good! If you don’t have any avocados on hand, you could also opt for some salsa. The condiments are all up to you! I won’t judge – promise. This post is all about the chicken nuggets recipe and that’s what we need to dig right into. 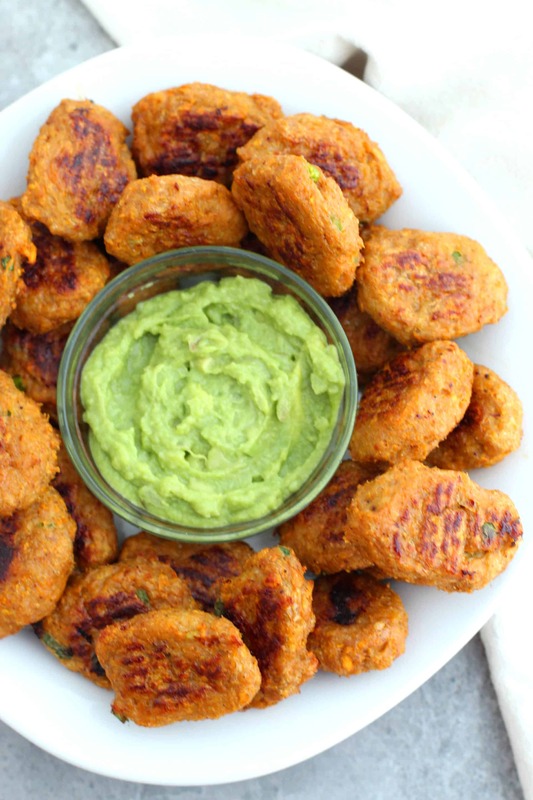 Paleo friendly chicken nuggets are perfect for a mid-week dinner. Preheat oven to 400 degrees F. Line a baking sheet with parchment paper and set aside. 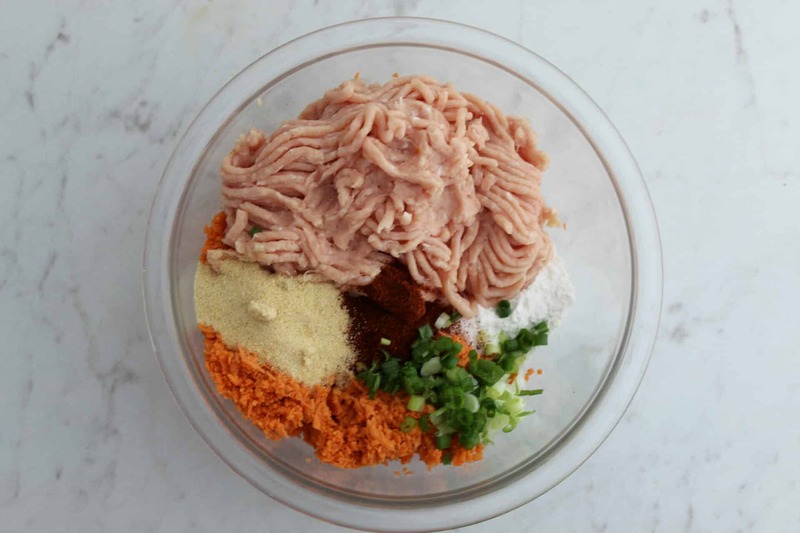 In a large bowl, add all ingredients and use clean hands to fully incorporate. Using a measuring tablespoon, scoop out the mixture and roll it into a ball before flattening and shaping it into nuggets. Place on the baking sheet. Bake nuggets in the preheated oven for 24-27 minutes, and flip halfway through to lightly brown both sides. Allow nuggets to cool for 5-10 minutes before serving. 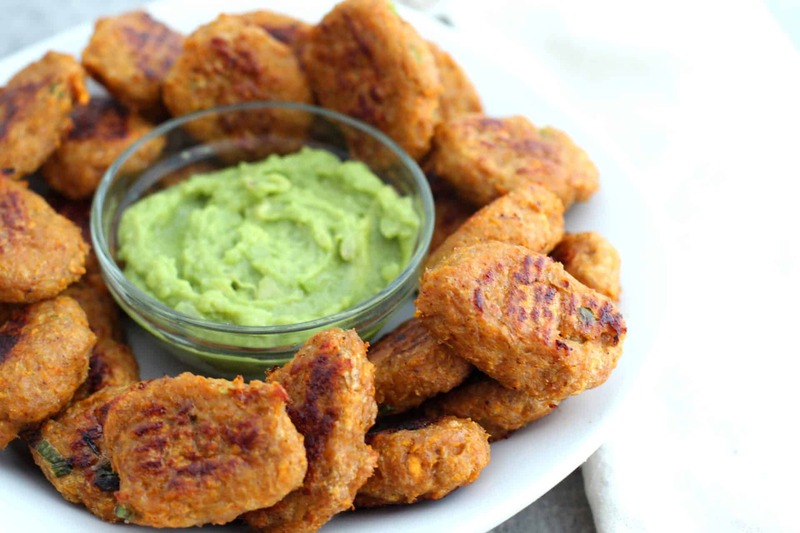 The nuggets pair well with guacamole or paleo approved ranch for dipping. In my personal opinion, they need a little dip to complete the taste. Kids will probably want ketchup and listen – if you want to go route… by all means. But guacamole will kick it up a notch for sure. Can I Freeze These Nuggets? Freeze option: Follow instructions as written. Place cooled nuggets in freezer bag or container and freeze. When ready to eat, remove from freezer and place on a baking sheet. Bake in a 400-degree oven for 10-12 minutes. Cool before serving. What do you think about these paleo friendly chicken nuggets? You can make them for the week and serve them to your kids for lunch as well! It’s not just about dinner options, you know. This chicken nugget recipe is healthy and delicious. Print it below and save it for a rainy day… or a Monday… or a Tuesday. 🙂 And make a few more for me just in case I pop by. In a large bowl, add all ingredients and use clean hands to fully incorporate. Using a measuring tablespoon, scoop out the mixture and roll it into a ball before flattening and shaping it into nuggets. Place on the baking sheet. Bake nuggets in the preheated oven for 24-27 minutes, and flip half way through to lightly brown both sides. Allow nuggets to cool for 5-10 minutes before serving. Notes: The nuggets pair well with guacamole or paleo approved ranch for dipping Freeze option: Follow instructions as written. 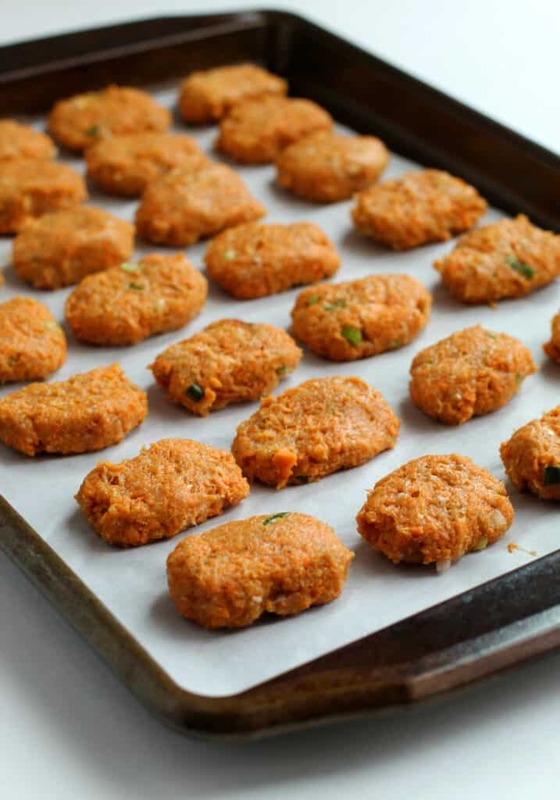 Place cooled nuggets in freezer bag or container and freeze. When ready to eat, remove from freezer and place on a baking sheet. Bake in a 400 degree oven for 10-12 minutes. Cool before serving.